In politics, a dark horse is a candidate who emerges from relative obscurity to win a primary election and, with it, his or her party’s nomination. The term derives, unsurprisingly, from horse racing, and is attributed in its modern use to Benjamin Disraeli’s 1831 novel The Young Duke. A classic example in Georgia’s political history was the late Governor Lester Maddox, whose only statewide electoral experience when he claimed the governor’s mansion in 1966 consisted of a failed bid for the Democratic nomination for Lieutenant Governor in 1962. Maddox owned the infamous Pickrick Restaurant and became known statewide when civil rights activists staged demonstrations outside the whites-only eatery in 1964-65. Ultimately, Maddox chose to close down rather than serve black customers in compliance with the federal Civil Rights Act. 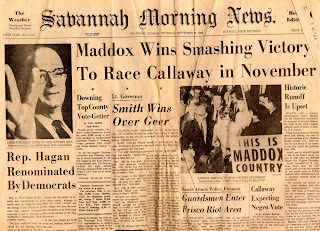 Entering the race for Governor in 1966, Maddox faced a crowded Democratic primary. The field of candidates included former Governor Ellis Arnall, former Lieutenant Governor Garland T. Byrd, segregationist businessman James H. Gray of Albany, and future Governor and U.S. President Jimmy Carter. Though vocal in his opposition to racial integration and federal civil rights laws endorsed by the Johnson White House, Maddox did not appear any better positioned than Gray or Carter against Arnall. The former Governor seemed to have the advantage, as his was the most recognizable name on the ballot. In the primary election Arnall led with 29.4% of the vote. Surprising most political observers, Maddox placed second with 23.6%, followed by Carter at 20.9%, Gray with 19.4%, and Byrd trailing behind with a mere 5.1%. In the September 28th runoff, Maddox ran as a hard-line conservative against Arnall, uniting former Gray and Byrd supporters to defeat the progressive former Governor with 54.3% of the vote. The GOP nominated first-term U.S. Representative Howard “Bo” Callaway, the first Republican to represent Georgia in Congress since Reconstruction and the first Republican nominee for Governor since 1876. As public sentiment in the state continued to turn away from an increasingly liberal national Democratic Party, and Georgians continued to resist federal efforts to desegregate the South, the Republican Party seemed to have new hope in the state. For proof, an observer need look no further than Georgia’s support for Republican Barry Goldwater in the 1964 presidential election, the first-ever Georgia victory for a GOP presidential candidate. What Happened in the General Election, You Ask? In the general election Callaway identified himself as a “Goldwater Republican” and opponent of the Civil Rights Act. Maddox used his standoff at the Pickrick as a springboard for segregationist martyrdom. Angered by their party’s choice, a number of Democratic activists voted for Arnall as a write-in candidate, ridiculing Callaway’s “Go Bo!” slogan with the retort “Go Bo, and take Lester with you!” On November 8, Callaway made electoral history once again as the first Republican to place first in a Georgia gubernatorial race in almost a century, gaining 46.5% of the vote to Maddox’s 46.2%. Arnall took 7.1% of the total, and since no candidate had won an outright majority the election was thrown to the General Assembly for state legislators to decide on a victor. Because a lopsided majority of legislators were Democrats and had signed party loyalty oaths therein, Maddox was chosen as Governor. The Howard H. (Bo) Callaway Collection and Clifford Hodges Brewton Collection of Lester G. Maddox Speech/Pres Research Files are filled with great primary resources documenting the 1966 gubernatorial race, as well as what happened to these candidates after the dust settled.